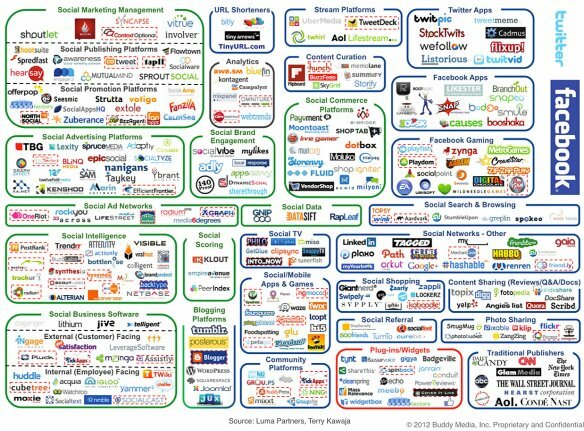 In case you haven’t been paying attention, the Social Media/Marketing marketspace is starting to consolidate – rapidly. What’s driving this consolidation is M&A activity by the large cap market leaders, most notably Salesforce.com who is apparently about to purchase Buddy Media for more than $800M. This follows Oracle’s just-announced $300M acquisition of Vitrue. Salesforce started this a bit over a year ago with their $326M acquisition of Radian6, which instantly made life significantly more difficult for other social analytics startups. I know all too well – I was one of those other startups. The problem is that with the massive proliferation of early-stage startups these past few years, there are simply not enough seats for them all to find a buyer, go public or otherwise exit. 5 years from now, 5-10% of the vendors on this extremely complicated chart below will be part of a much bigger company, and most of the remaining 90-95% will no longer exist. If you’re in the latter group (or if you didn’t make this chart at all) – best advice I can give you is to hire the best Bus Dev person you can find. Quickly. VP Strategic Growth at Unifi Software. Previously VP positions at HP Vertica, Yankee Group and Aberdeen Group, amongst others.